I will slap the next person who says "Oh, your body just falls apart as you get older", or "You won't be doing xxxx when you're 50". I'm bloody 50 in less than four months and I'm not ready to just sit around and knit yet. Or probably ever. LOL. Phat Camp in a week's time. Two and a half days of killer workouts, with a bunch of positive, health and fitness focused ladies. BOOYAH! Yes, I will be crippled with DOMS for probably a week afterwards, but hell; at least I'll know I'm alive. The return to full-on crazy-arse fitness and strength. I'm well on the way to this already. I'm not being reckless; I see my physio every week, I listen to his advice, I take breaks at work, and I'm following a graduated approach to training so that I don't do the old snakes-and-ladders act and find myself right back where I started. But I will not be beaten! 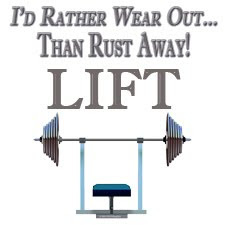 I want to run, I want to lift heavy stuff, I want to be full of energy, well into my sixties and beyond. I do NOT want to be sitting on the couch moaning about my lumbago (I don't even know what that is, to be honest). I don't want to join the "over fifties" activities my local council runs. I spotted a link on their website a while back and thought Ooh - what can I get for nix? I clicked through and found it was all gentle walks and macrame and bus trips to the rose gardens for seniors. As I commented to my GP "I'm turning fifty, not bloody ninety!" Injuries aside, I'm feeling remarkably young for my years. I look around at other people my age, and listen to them complain about their backs, their necks, their blood pressure and cholesterol and so on. And I realise that my mad exercise addiction is actually helping to keep injuries at bay, not making them more likely. I stop training; I suffer problems with my hip and lower back. I step up the intensity and frequency of training and the pains disappear. Love love love your attitude, Kerryn. 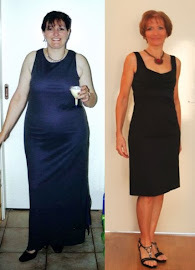 I look at my mother in law and am horrified that that could be ME in 30 years...life is so precious, why would you want to spend it moaning and groaning about your bad health and accepting that a 5kg gain a year is "normal" and there's no point watching your diet or exercising hard at "our age". Don't forget, we need to have starting benchmarks by Sunday. *highfive* Let's kick some tail! Okey dokey, boss! I'll come up with some starting points and post 'em up. Probably tomorrow - got a house to clean and organise for Number One Son's birthday BBQ tonight. So true. The sports centre I've started going to in Tokyo is full of old people (maybe cos I go in the middle of the day when everyone else is at work) and the other day I got shamed into running on the treadie cos I couldn't be beaten by the two 80 years old either side of me!